At Samaritan International we always go above and beyond to save your teeth. We believe that tooth extraction should be the last option. That is why, we offer you with several dental services including dental crowns, root canal, and dental implants. However, there are cases when the tooth is severely damage that tooth extraction is necessary to maintain dental health. 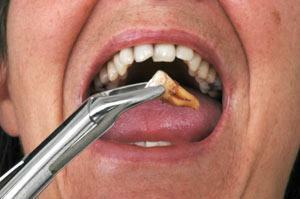 We recommend tooth extraction if the tooth is severely decayed and is beyond repair. Likewise, we also suggest removing the tooth that is associated with advanced stages of periodontal disease as well as impacted wisdom tooth particularly those that are poorly positioned and have adverse effect on your other teeth. Your Tijuana dentist will conduct a free thorough dental check up and assessment to explore all available options. We will then discuss with you the treatments that are applicable to your unique condition. If tooth extraction is the only option, you can expect nothing but exceptional service from us here. Rest assured that we will make every attempt to make the whole procedure as comfortable as possible. The cost for tooth extraction range from $70 to $230 depending on the type of procedure you require. Although regular tooth extraction is just $70, the price can go up to $230 for wisdom tooth extraction as this is considered minor operation.